McCraken will make his long-awaited return on Saturday when facing eight rivals in the $250,000 Sam F. Davis Stakes (G3) at Tampa Bay Downs with regular rider Brian Hernandez Jr. aboard. 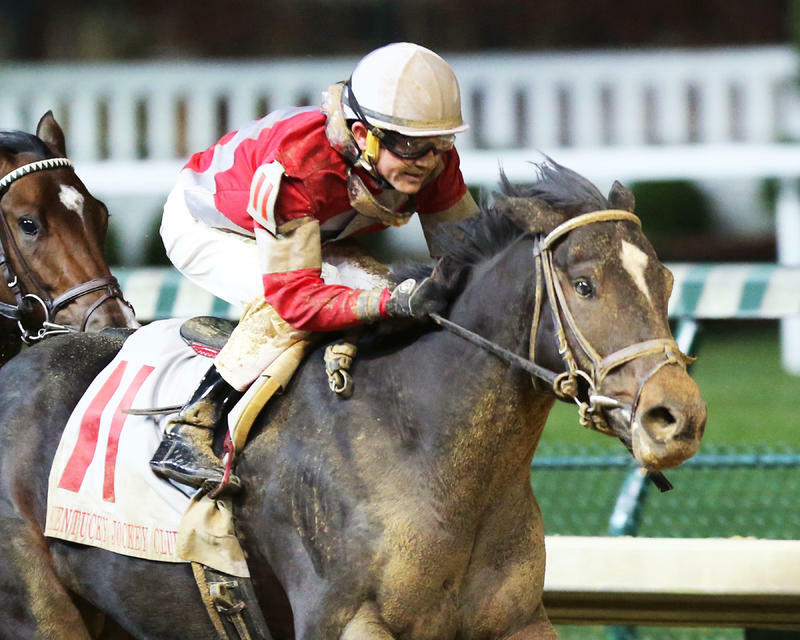 The 1 1/16-mile contest makes its debut this year on the Road to the Kentucky Derby series of races offering points toward a spot in the starting gate of the Run for the Roses on May 6 at Churchill Downs. The race is worth 10-4-2-1 points to the respective top four and, in addition to McCraken, also marks the sophomore debuts of No Dozing, Wild Shot and Fact Finding. Most eyes will be turned to McCraken, though, as the Ian Wilkes-trained colt attempts to move his record to a perfect four-for-four. The bay son of Ghostzapper easily broke his maiden by 2 1/2 lengths sprinting 6 1/2 furlongs on October 2, returned 28 days later to take the one-mile Street Sense Stakes by 3 3/4 lengths, and closed out his juvenile campaign with a nice 1 1/4-length victory in the Kentucky Jockey Club Stakes (G2) on November 26. All three of those starts came at Churchill Downs, so McCraken will be trying a new track in this spot. “He’s right where I want him,” Wilkes said of McCraken, who will ship in the day of the race from Palm Meadows Training Center. “He’s a little stronger and bigger than he was last year and he has trained very forwardly, and he’s sharp. He’s ready to run. “Any time you’re in a Kentucky Derby prep, it’s not going to be an easy race. I expect my colt to run well, but it’s not the end of the world if he doesn’t win. He’s got to face a little adversity. While McCraken is looking to retain his unblemished mark, No Dozing will try to get back on the winning track. The Arnaud Delacour pupil has been training at Tampa Bay Downs since late December and on Wednesday schooled in the paddock between races ahead of his 2017 debut. No Dozing’s last start came as a runner-up effort in the Remsen Stakes (G2) at Aqueduct on November 26. Prior to that the Union Rags colt finished fourth while making his stakes bow in the Breeders’ Futurity Stakes (G1) at Keeneland in early October. He kicked off his career with a pair of wins at Delaware Park and Laurel Park. “I think it always helps, not especially to work on the track but to be familiar with the scenery,” Delacour remarked about No Dozing running out of his stall on Saturday. “You’re paddock-schooled, you’re there every day and you don’t have to ship, so there is a little bit of a stress factor that is more controllable. Jockey Daniel Centeno has the return call on No Dozing. Like McCraken, Fact Finding brings an unbeaten three-for-three scorecard into the Sam F. Davis. Trained by Todd Pletcher, the gray son of The Factor has romped in his trio of starts thus far, including a seven-length wire job in the Smooth Air Stakes last out on December 10. John Velazquez has been aboard for all those starts and will be holding the reins on Saturday. Wild Shot will be looking to turn the tables on McCraken after finishing second to that rival in the Kentucky Jockey Club last out. The Rusty Arnold charge entered that contest off a third-place effort in the Breeders’ Futurity and will have Robby Albarado aboard for the first time in this spot. Also of note in the Sam F. Davis are Tapwrit, who captured his last two races including the Pulpit Stakes at Gulfstream Park on December 10 to earn a 98 BRIS Speed rating; Chance of Luck, winner of the Inaugural Stakes and a half-length second in the Pasco Stakes both over the track; and State of Honor, who gets blinkers added to his equipment after just missing by a head last out in the Mucho Macho Man Stakes. Stakes winner King and His Court and maiden victor Six Gun Salute complete the Sam F. Davis field.